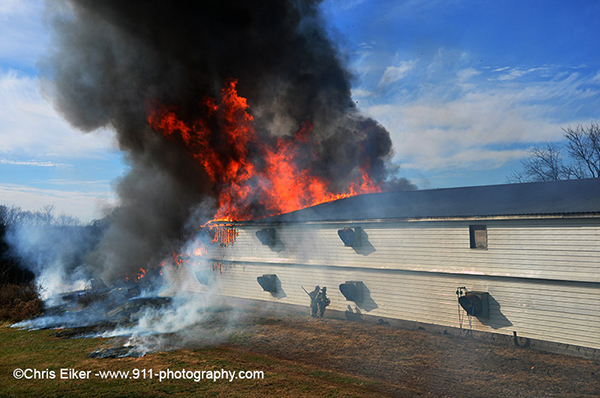 July 17, 2012, 2936 Arthur St North, just north of Elmira Ontario Canada. 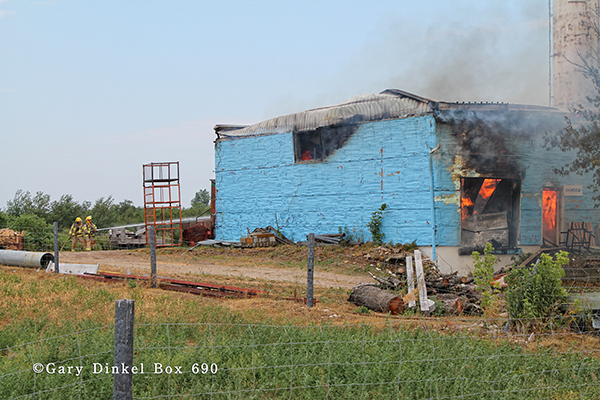 Box 690 members were at Station 5 in Kitchener restocking supplies from a call in Petersburg when Floradale, Elmira, Conestogo, and St Jacobs were toned out for a wood shop fire at 10:20 am. 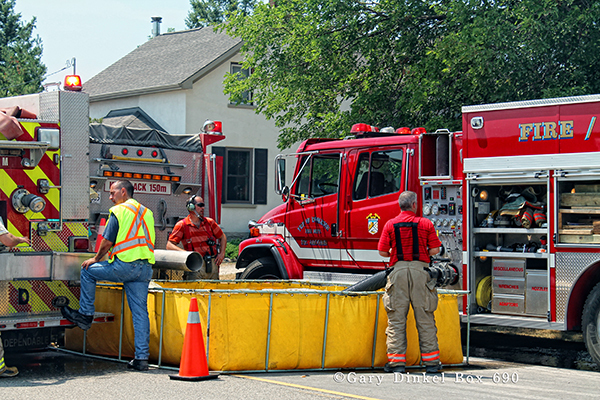 Floradale firefighters reported heavy smoke showing from their hall. This was the hottest day ever on this date (118 F). 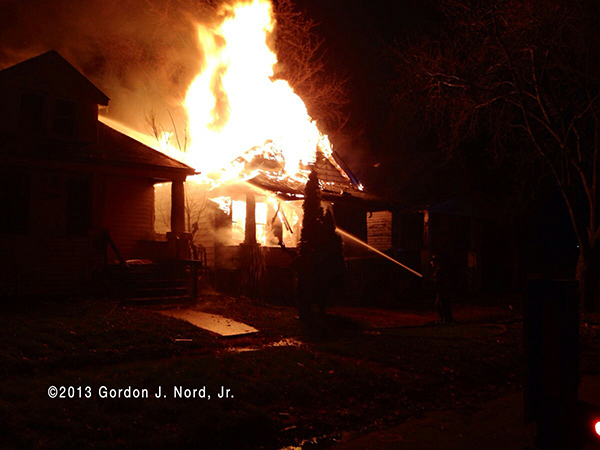 The building was fully involved on arrival. 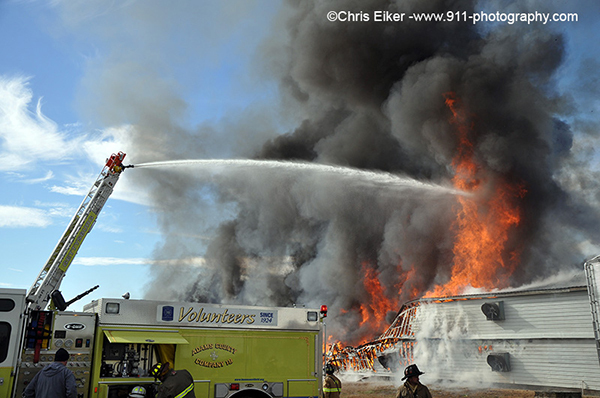 The fire had spread to two 54’ trailers that contained wood, and piles of lumber on the E4 side of the building, and a large storage shed full of wood to the rear of the structure. 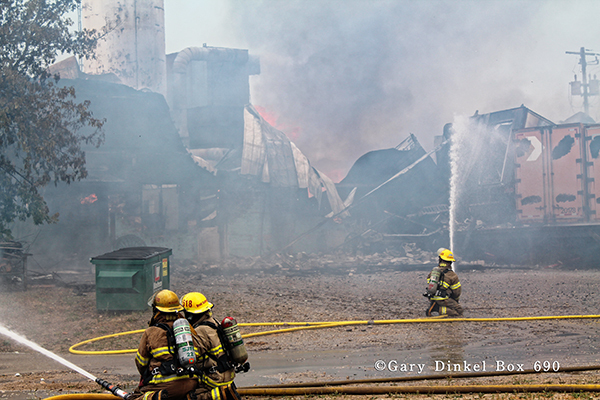 More than 60 firefighters were on-scene battling the fire and the heat of the day. 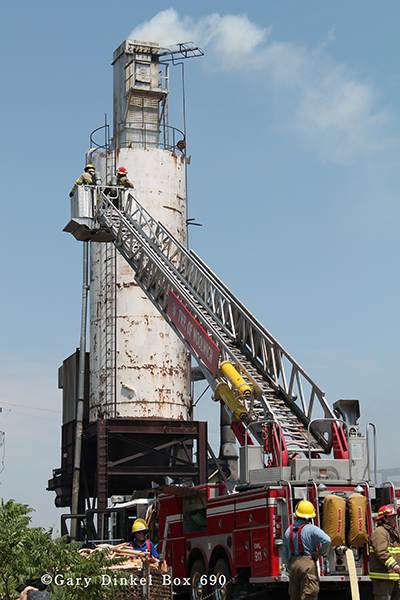 Water was shuttled by three tankers from a large pond located adjacent to the fire, to the St Jacobs pumper that set up on Arthur St. Elmira’s P1 set up to draft at the pond, and a 4” supply line was hand laid from the pond, 1,400’ to the Floradale pumper. 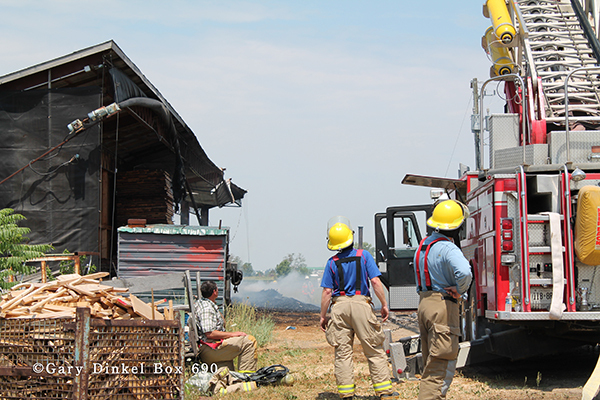 The fire was at a Mennonite Wood Business, damage was over $1,000,000. 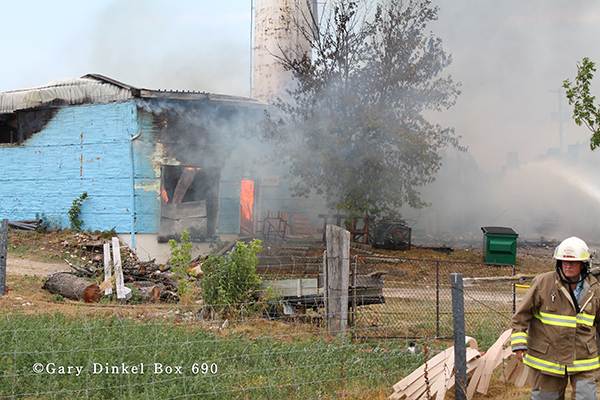 Box 690 responded initially with three members. 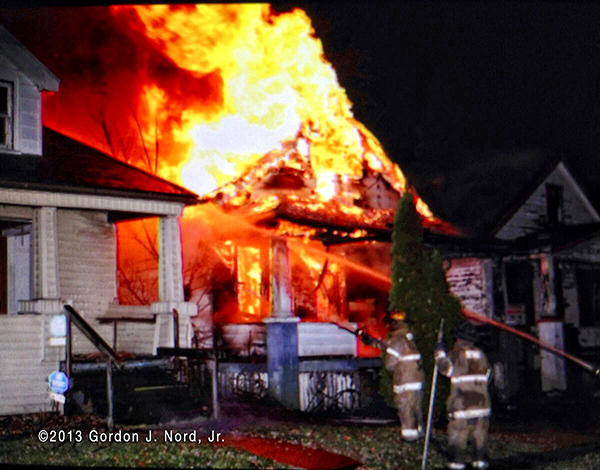 We were very fortunate to have the assistance of the Floradale Ladies Auxiliary at this fire. 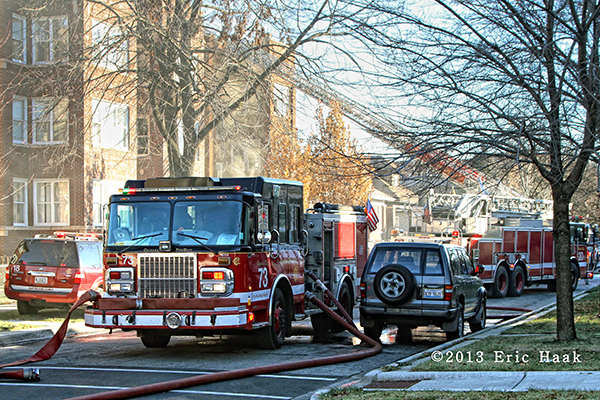 Box 690 was on scene for eight hours and served 1,278 food and drink items on that day. This was by far the largest call in terms of product served that we have had in our 25 years of service. 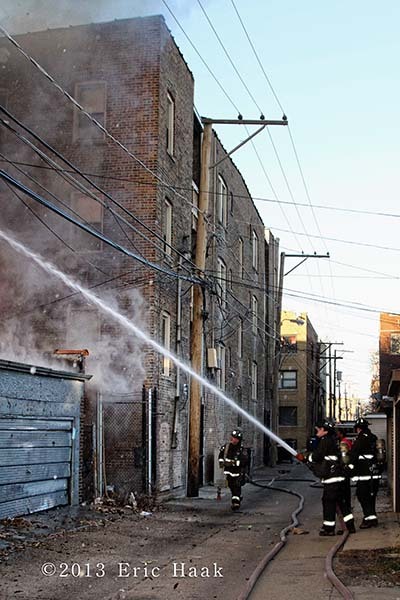 Shortly before 1530hrs on Wednesday, November 27th, companies in Chicago’s 23rd Battalion were dispatched to the report of a garbage can on fire in the rear of a building on the 8000 Block of South Ellis. 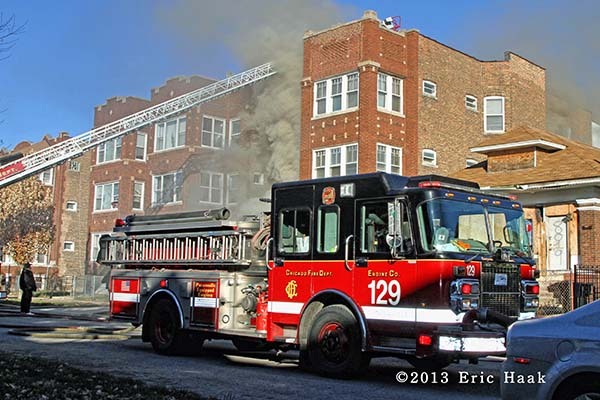 While companies were en route, the Englewood Fire Alarm Office informed Engine 122 that they were getting a Full Still as they were getting reports that the rear of the building had become involved. 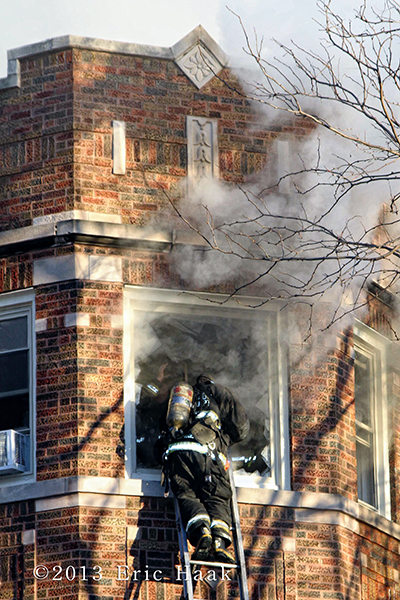 Very shortly after that, the alarm was elevated to a Still & Box for the reports of people being trapped on the second floor. Engine 122 arrived on-scene and reported that they had a fire in the rear of a 3-story, 50 x 65 ordinary, occupied apartment building. 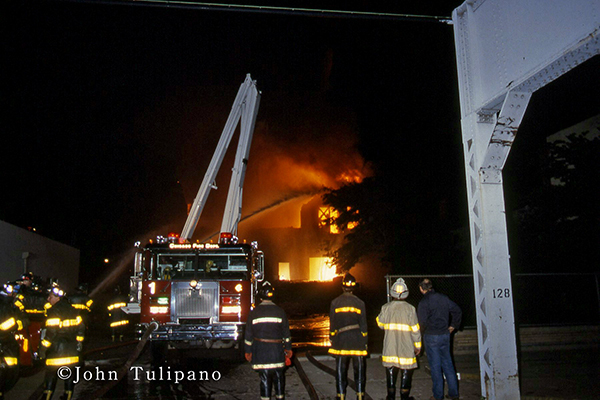 Engine 72 positioned itself at the mouth of the alley on 80th Street and led out several lines to sector 3. 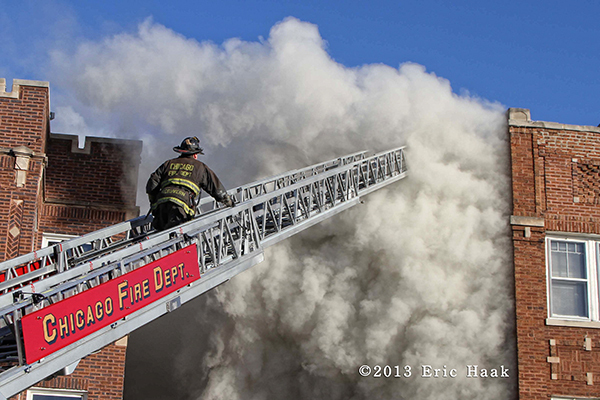 The first several images were before any lines were laid and before Engine 72 arrived. 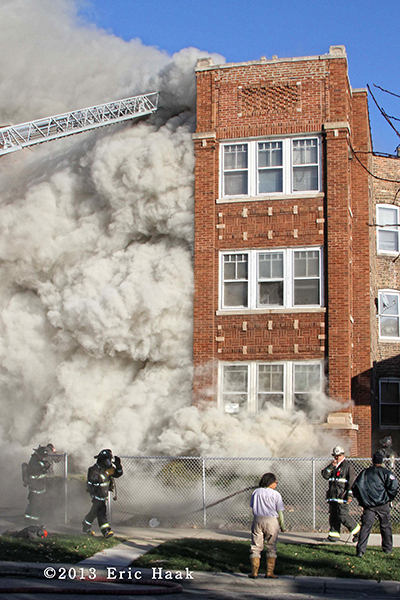 You can see that the balconies of the sector 2 exposure were involved and the volume of fire between these two buildings was very heavy, which led to the 2-11. 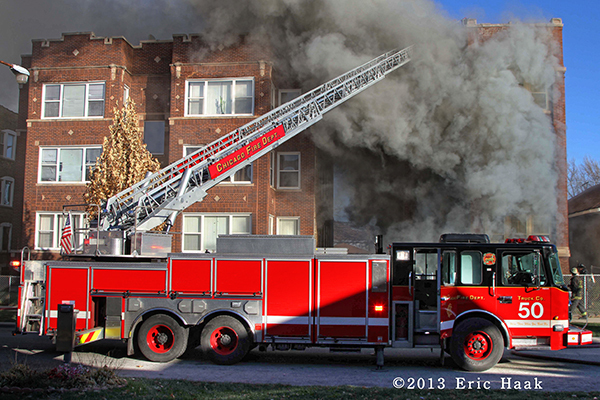 The sector 2 exposure was a large 100 x 75 U-shaped courtyard apartment building. 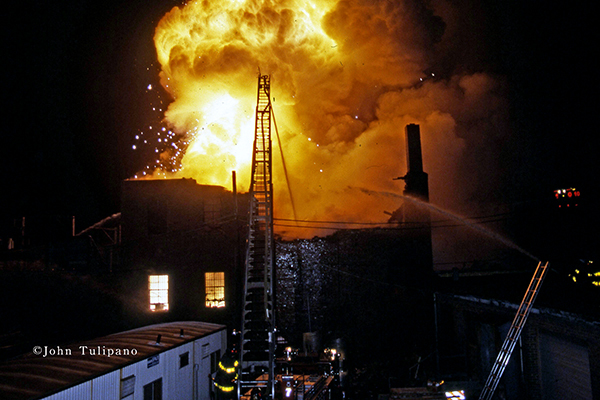 The fire consumed the rear porches of the fire building very quickly and the entire rear of the structure collapsed into the yard. 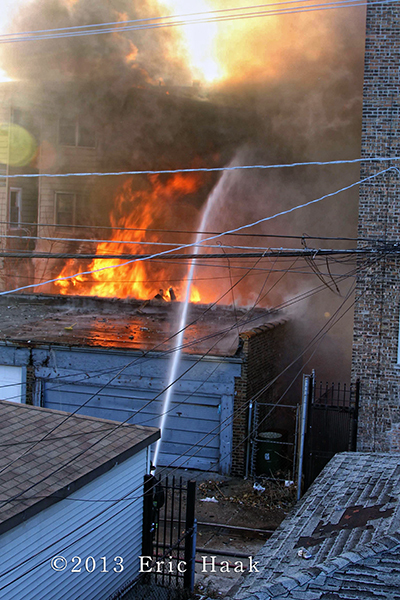 Companies eventually removed both garage doors and fought the remainder of the incident from the rear windows of the garage. 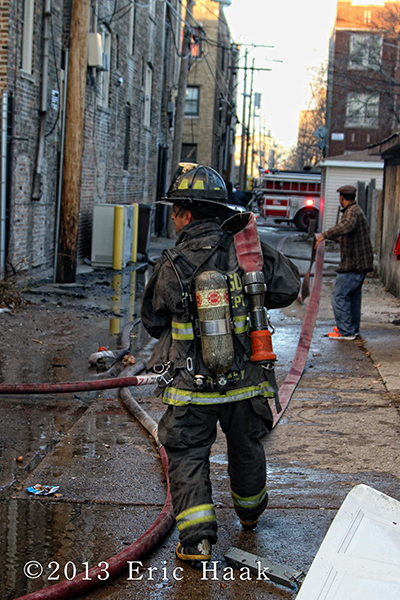 Engine 126 took a hydrant on Dobson Avenue, one block east of the fire and ran two lines through the gangway to the alley. One of these lines was eventually used from a balcony of the sector 2 exposure in order to get a better POV. The space available in sector 3 for companies to work in was very limited. The 2-11 was struck out at 1619 hrs. One civilian was transported from the scene in good condition. 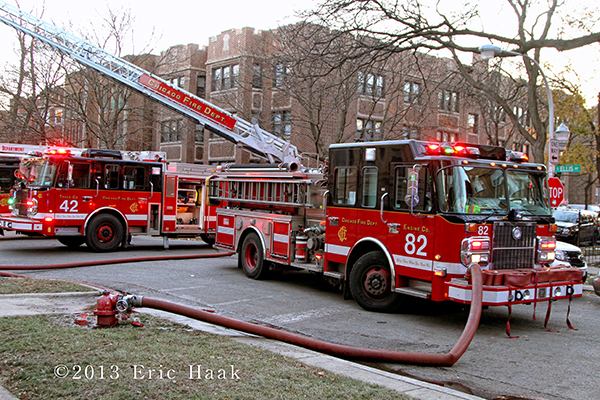 I wish I could have gotten more shots from the front with Tower Ladder 34 but the police taped off the entire front of the building and moved everyone off Ellis. I was only able to get a few shots off before they moved us. The goofy thing was that not much was happening in the front and the alley was far more dangerous but they never taped that off. Go figure. 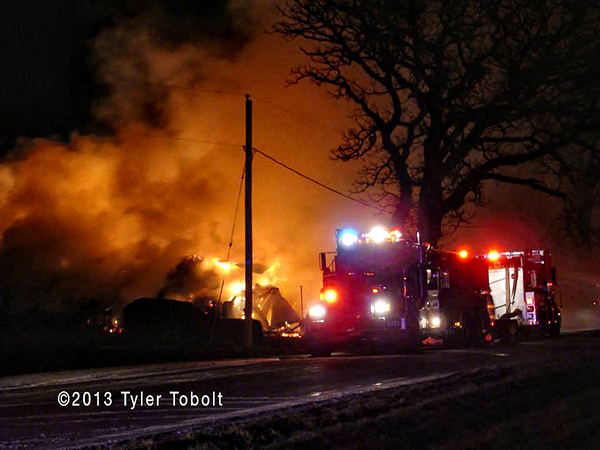 Last night (Nov, 26th, 2013) the Woodstock FRD was dispatched to a possible barn fire at 16812 Kunde Road in Union. 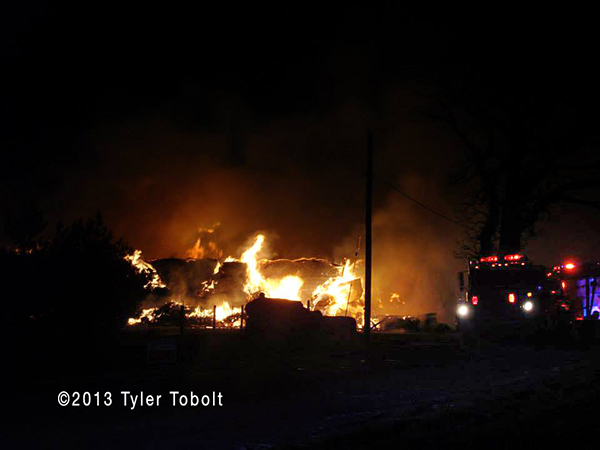 Units arrived with a fully involved hay barn. 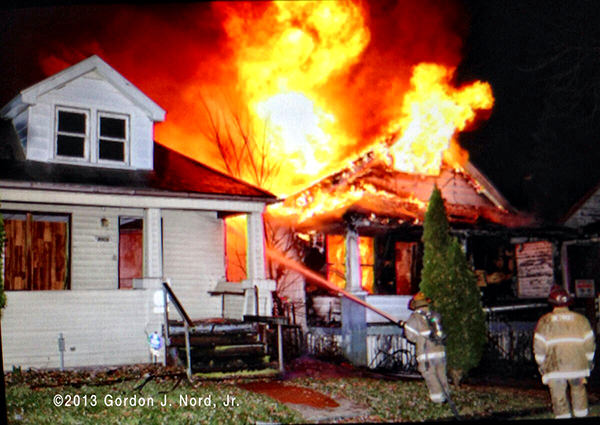 Command requested MABAS Box #5-73 to the 2nd Level at 6:40pm. 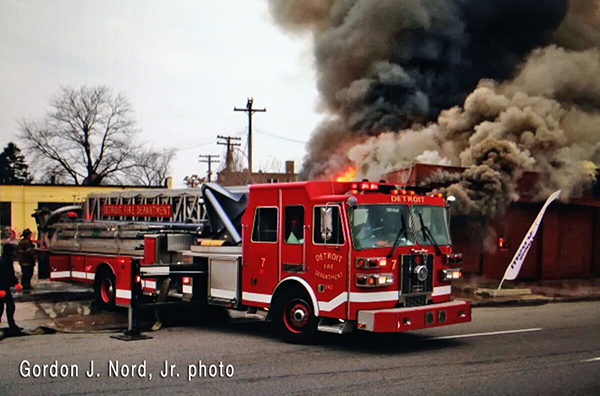 Due: a Crystal Lake engine, a Marengo engine, a Union tanker, a McHenry tanker, a Cary tanker, a Harvard squad, a Wonder Lake squad, a Huntley RIT chief and engine, EMA and the Salvation Army. 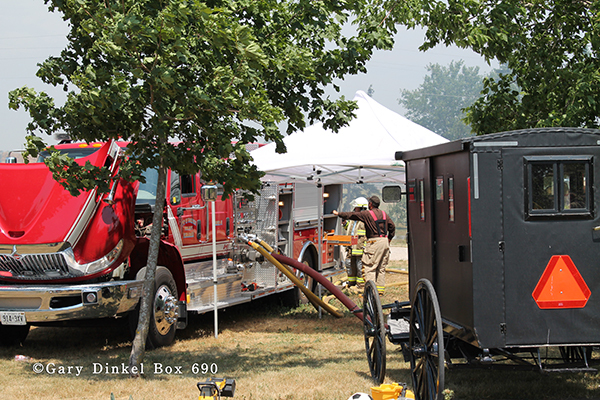 COQ: Fox Lake engine, Marengo EMS, Woodstock chief, and Nunda Rural tanker. 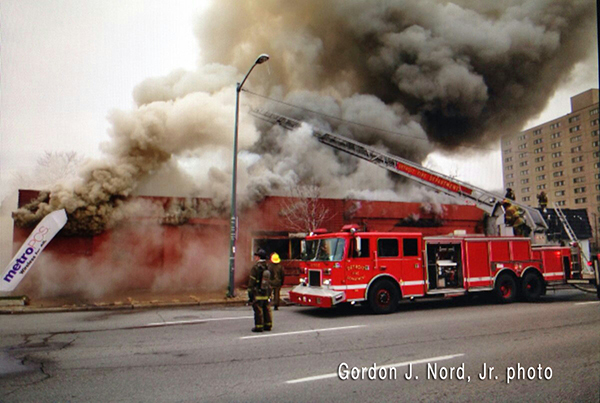 Shortly thereafter, command requested Box 5-73 to the 3rd Alarm at 6:48pm . Due: a Wauconda engine, the Nunda Rural tanker, a Hebron tanker, an Algonquin truck, a McHenry squad w/cascade, and a Harvard chief. 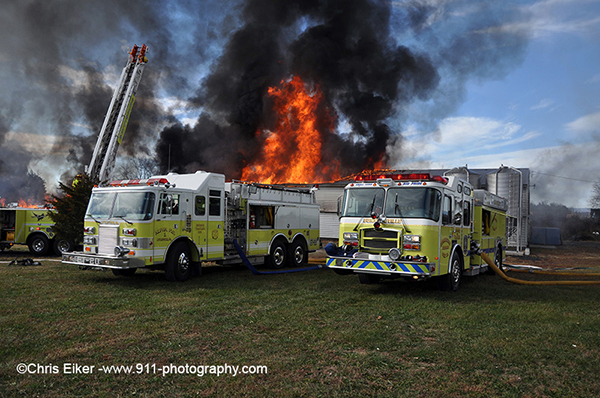 Around 7pm command upgraded to the 4th Alarm for tankers only which brought a Hampshire tanker, a Spring Grove tanker, a Fox River Grove tanker and a Richmond tanker. 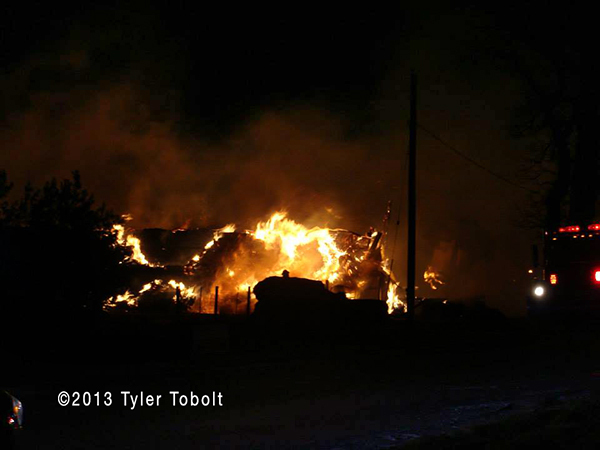 Crews were battling a large hay barn that was fully engulfed with some exposure. All tankers operated supplying multiple lines. 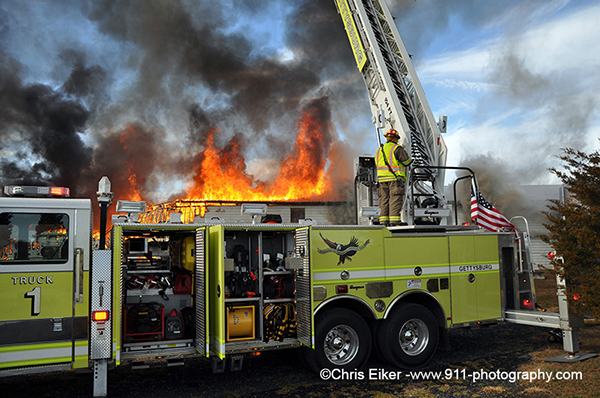 About 1.5 hours into the incident, command requested Box 5-73 to the 5th Alarm for engines only which brought a Rutland-Dundee engine and an engine from Walworth, WI. 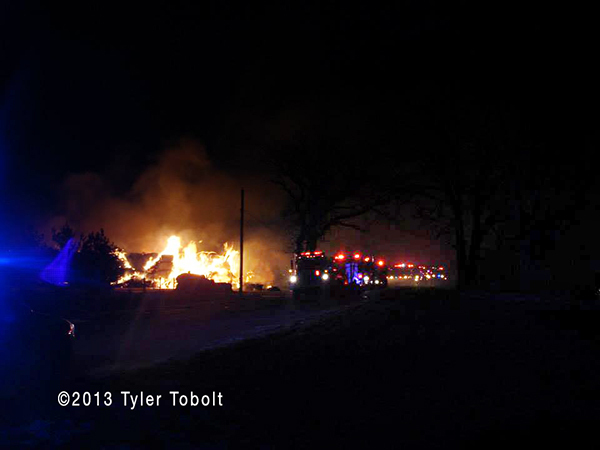 The MABAS Box was struck out around 9pm All crews were still working at that time. 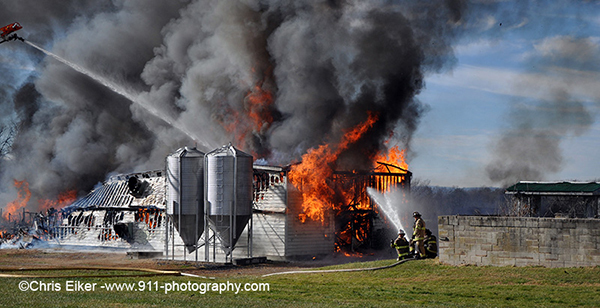 Monday morning at 10:34, Adams County Box Alarm 22-3 was struck for the barn fire at 2425 Baltimore Pike, Gettysburg Pa. 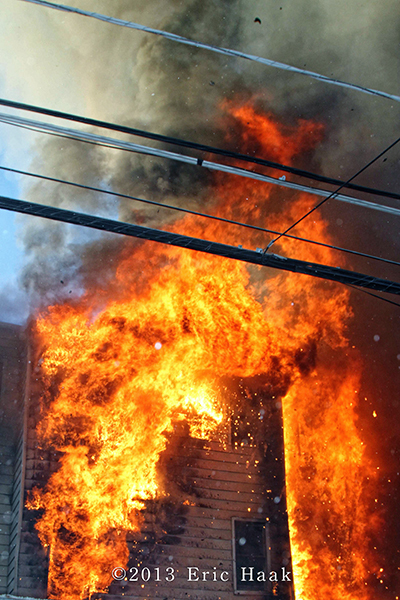 It was clearly evident from the number of calls the Adams County 911 Center was receiving that this was going to be a working fire. A large black header was visible for miles. 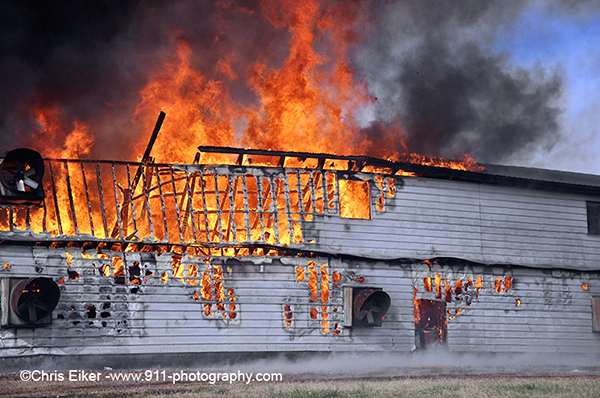 Units were notified on dispatch of a working barn fire. 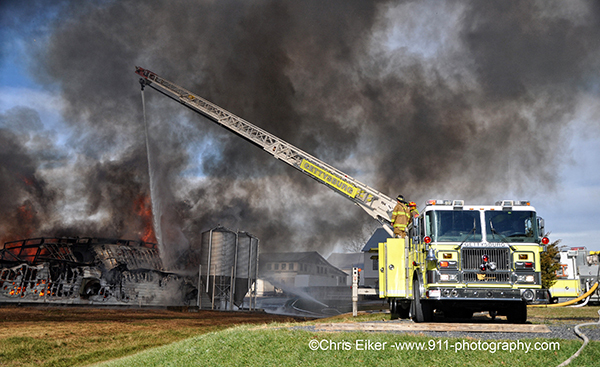 Truck 1 arrived with an 80’ wide by 450’ long barn with fire showing. The barn was being used for storage. No animals occupied the barn. 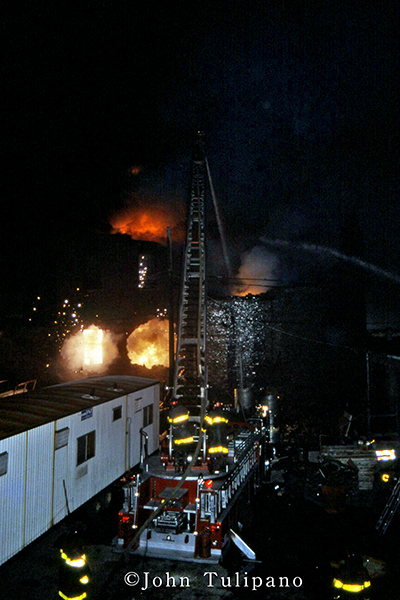 Firefighters were challenged from dispatch as this fire had a large fire load since the building was completely filled with storage items, making it too dangerous to fight the fire from the interior. 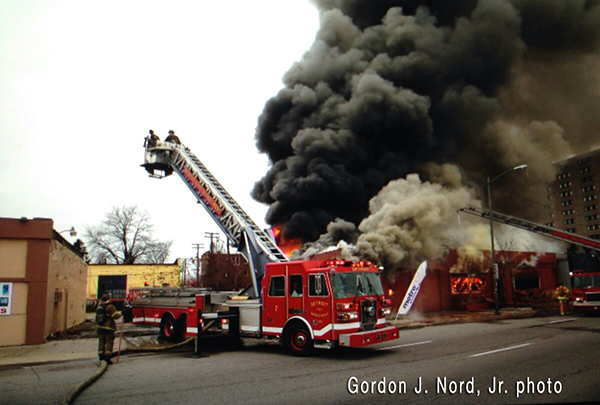 Multiple master streams and a ladder pipe from Truck 1 were used to extinguish the fire. 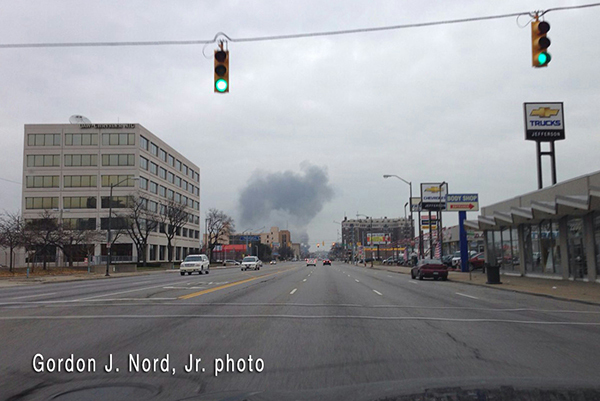 In addition there were several propane tanks on the exterior of the building. 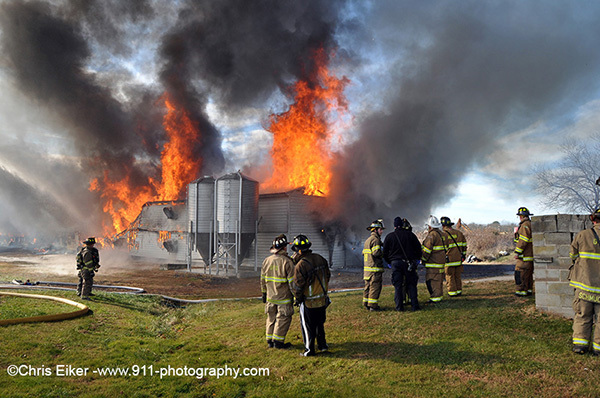 Firefighters worked fast to cool the tanks. 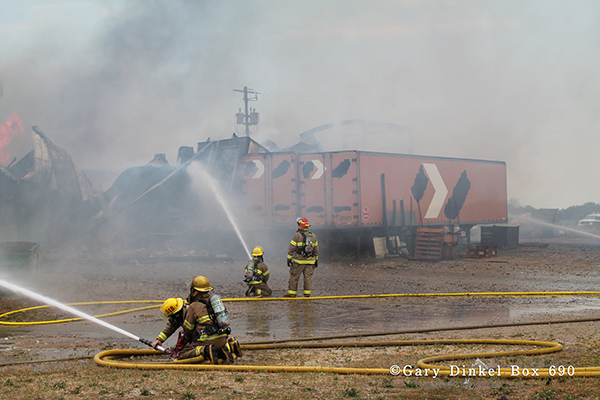 Several pieces of construction equipment were removed from the scene by the property owner as firefighters battled the blaze. 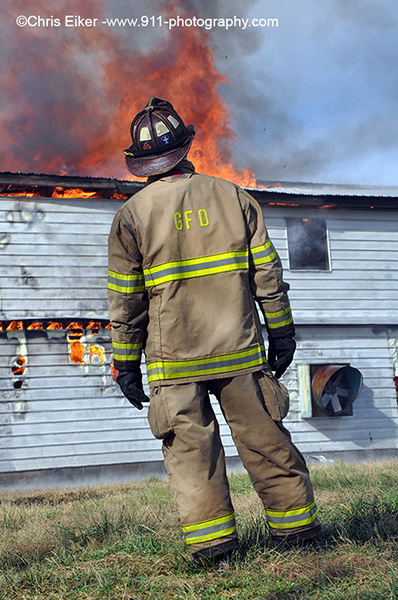 It took nearly 2 hours to bring the fire under control. 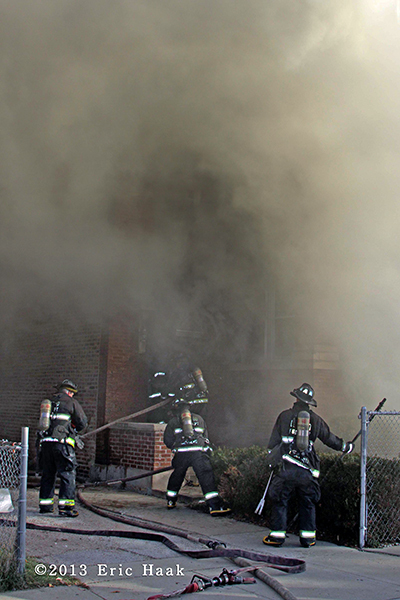 At 1412hrs on Sunday, November 24th, companies on Chicago’s south side were dispatched to a report of a structure fire on the 8000 block of South May Street. 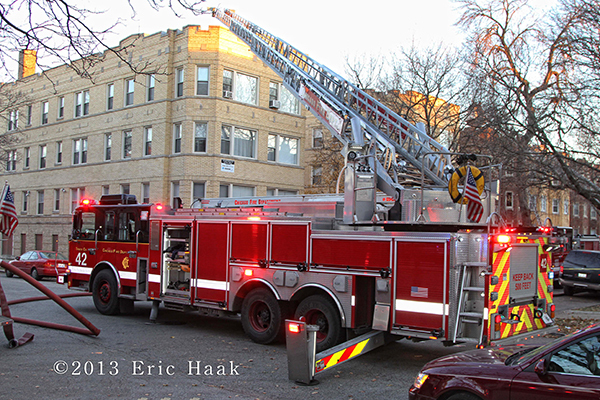 Three minutes later, Engine 129 reported they had a fire in the basement of a 30×125, 3.5-story ordinary, occupied apartment building. 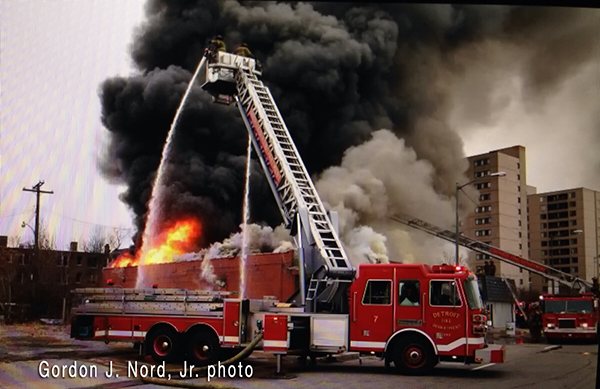 At 1420hrs, Battalion 18 reported that he had heavy fire in the basement and 1st floor of the building and he called for a Still & Box which is about the same time the first picture shown in this gallery was taken. 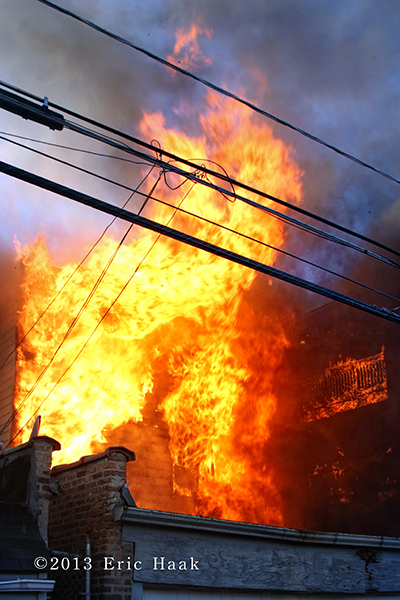 The fire eventually made its way to the second floor. 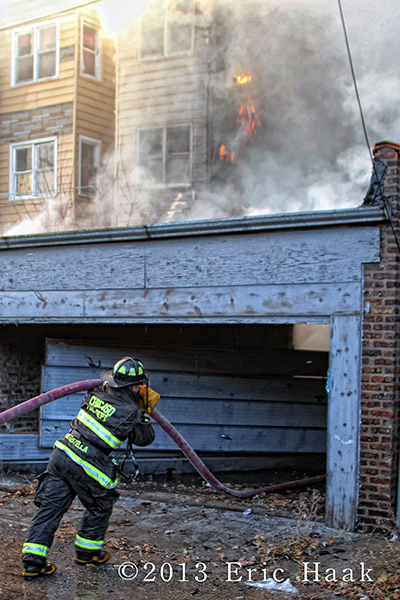 Besides the apparatus shown in the photos, Engine 54 took a hydrant on Aberdeen Street which is one block to the east and stretched a line through the gangway to sector 3. 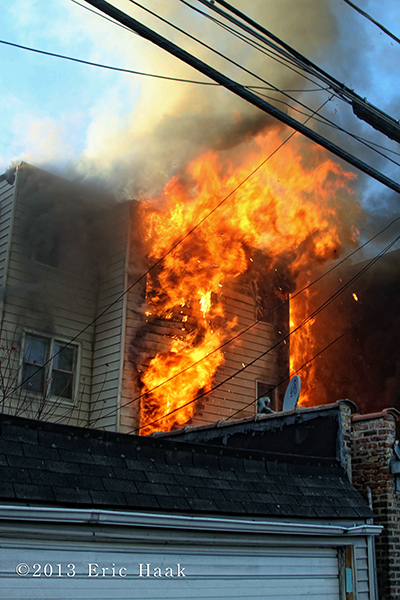 The box was struck at 1514hrs and the Red Cross was assisting 11 occupants who were displaced by this fire.